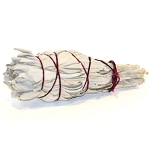 Home > Altar, Ritual and Spellcraft > Smudging > WHITE SAGE SMUDGE STICK 3"
These small white sage bundles measure approximately 2-3" long, bound with string to keep the leaves tight and in order. Smudging is an important purification ritual in many different cultures and traditions, used for purification and blessing. These smudge stick bundles are ideal for multiple uses, if put out properly at the end of each session, the sweet white sage bound within can last you through several uses, even when used for an extended time in ritual.